While a thermographer is the most important part of any infrared inspection, no thermographer can get very far without a working imager. This week’s Tip includes some time-tested suggestions to ease air travel with an infrared imager. Few experiences are more frustrating than traveling to a distant jobsite and discovering that your infrared equipment has been either delayed or damaged in transit. Such experiences can result in project delays or costly repairs. Lastly, be certain to check Customs regulations when traveling internationally. Many countries restrict the import/export of infrared equipment; others may require that an independent customs agent be hired to get expensive test equipment in/out of the subject country. Recently there has been considerable debate among home inspectors regarding whether thermal imaging should be part of a home inspection. With prices for thermal imagers at an all-time low, thermal imaging may be poised to become an integral part of every home inspection. A previously satisfactory explanation can be eroded by accumulating contradictory facts. When that happens, it’s time for a new explanation that takes into account all the facts, old and new alike. This giving way of an old world view in favor of a new one is called a paradigm shift. 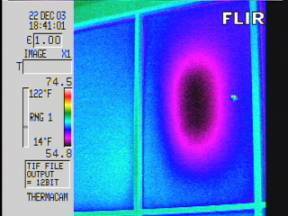 In my considered opinion, infrared thermography is driving a paradigm shift in the business of home inspection. Home inspection is premised on general agreement that a home inspector is only responsible for describing defects which are readily apparent to visual inspection. 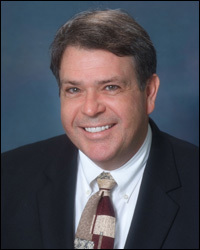 This explanation is supported by observation that to ask otherwise of a home inspector would subject him or her to legal liability for unreported defects which may be undiscoverable in the absence of extraordinary and costly investigative measures beyond the budget of the ordinary home buyer. The business of home inspection would soon be out of business as a result. The known variable in limiting the scope of home inspection is the cost of the additional inquiry. That is why a home inspector will often contract for additional investigation of specified defects which are not conclusively apparent to visual inspection, such as urea-formaldehyde, mold, and radon. Modern nondestructive technologies such as infrared thermography are changing the game, however, allowing for broadly applicable inspection techniques not limited to specific testing. This one new fact – the affordability of thermography – contradicts the old world view of home inspection, because a visual inspection can now include the previously invisible infrared part of the spectrum at little additional cost. There is no longer a need to restrict the scope of inspection to the visible wavelengths. The potential benefits of the modern technology far outweigh the cost, when prorated across the useful life of the training and equipment required. The law must and will in time follow the standards creep caused by the affordability of IR, and pull down the existing legal limitations of liability for home inspectors for unreported defects which could have been discovered with a handheld thermographic camera. In the near term look for the next step in the law that concerns home inspection: the case opinion that results in a regulation mandating written notice to consumers of the availability and utility of infrared thermography. Something as simple as a check-the-box notice on a pre-inspection agreement that an IR scan will/will not be provided should be the first step. Numerous injuries result from slips and falls on icy sidewalks, parking lots, roads and other outdoor locations every year. Snow removal, sanding and salting of these type areas can help but, many times, total elimination of snow/ice hazards are impossible and other measures must be used to cope with these problems. Focus on your walking path and pick steps that minimize or eliminate your exposure to icy slips. This is a time during which keeping your “eyes and mind on path” is more critical than ever. Accept and anticipate the fact that you are at risk of falling at any given moment when walking on ice. Adjust your stride so your center of gravity is maintained as directly above your feet as possible by taking shorter steps than usual. Don’t ignore the hazard presented by a slippery surface in your immediate path or work area. Take the time to spread sand, salt, or calcium chloride on icy areas and notify your Supervisor if further action is necessary. Keep in mind that salt (chloride) containing material is incompatible with stainless steel and is not to be used where contact can be made. Footwear should have slip resistant soles. Avoid leather soled shoes. Equate this to driving a car with bald tires in the winter. You need something suitable to grip the surface you intend to walk on. Wipe your feet off at the entrance of buildings so others won’t slip and fall on melted snow that has been tracked into the building. Like the ice under your feet, beware of icicles over your head; they can be dangerous. Although you cannot stop them from forming, you can minimize their effects by controllably knocking them down. Whether you’re dealing with an overhead or underfoot ice hazard, if you can’t control it, barricade or rope the area off. When walking down stairs with or without an item in one hand, Safety In Motion has a technique that can reduce your chance of falling down the stairs. Grasp the handrail in the palm up position trailing behind you instead of your direction of travel. Your feet should be positioned at a slight angle toward that railing. Should you loose your balance, your grip on the handrail in this position will cause you to come to a stop against the handrail instead of falling down the stairs. Try the technique and become comfortable with it before you need it. Make protecting yourself a top priority! 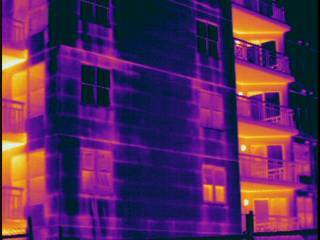 Infrared inspections of building envelopes can provide evidence of excess energy loss through walls, doors and roofs. Under the right conditions, thermal imagery can also provide evidence of excess energy loss through insulated window assemblies. Insulated windows are a common feature found on modern commercial and residential structures. Unlike single pane windows, insulated windows are manufactured with an Insulating Glass Unit (IGU). An IGU typically consists of two or more layers (lites) of glazing separated by a spacer along the edge and sealed to create a hermetically sealed air space between the layers. IGUs are then encased within a sash or fixed frame in order to facilitate installation. In order to increase the insulating performance of an IGU, the air space between the lites may be filled with air or inert gases like argon or krypton. Typically the spacer is filled with desiccant to prevent condensation. For some IGUs, most of the air is removed to further reduce convection and conduction through the finished IGU. Over time, IGUs seals can fail causing inert gas to be lost and/or allowing humid air to enter the assembly. Unless condensation occurs between the lites, failed IGUs are difficult to detect; however, they may be readily detected using a thermal imager under the proper conditions. center of insulated window. Pattern typical of failed IGU seal. Infrared inspection of insulated windows and building envelopes is one of many topics to be covered during Infraspection Institute’s annual technical conference, IR/INFO 2007 being held January 14 – 17, 2007 in Orlando, FL. For more information or to register, visit us online at www.infraspection.com or call us at 609-239-4788. To avoid discrepancies, personnel who utilize infrared radiometers should be trained in the proper use of their test equipment along with its limitations. Personnel must also understand how the characteristics of infrared instruments affect the accuracy of observed temperatures. Lastly, using cross-verification of temperatures should be avoided when radiometer capabilities differ from each other. When asked what a thermometer measures, most people will tell you that thermometers measure whatever they contact. The correct answer is a little more complex and is fundamental to understanding and accurately applying contact thermometry. Contact thermometry is a common technique used in temperature measurement. Thermocouples, resistance temperature devices, thermistors, and bulb thermometers are used to gauge the temperature of a wide variety of objects, materials, and systems. Although each works on a different principle, all contact temperature devices have one thing in common: contact thermometers report their own temperature. Prior to using a contact thermometer, make certain that the surface to be measured is safe to touch. Never use a contact thermometer on energized electrical equipment or on any machinery where contact could result in personal injury. Advanced heat transfer and temperature measurement are some of the many topics covered in the Infraspection Institute Level II Certified Infrared Thermographer® training course. For course schedules or to register for a course, visit Infraspection Institute online or call us at 609-239-4788. Temperature can be an indicator of the condition of installed electric motors; however, the best location for measuring temperature is often debated. In this Tip we discuss the best location for measuring motor temperatures. From our research it was found that measuring the exterior of the motor bellhousing within 1” of the output driveshaft consistently produced temperatures that were within 1 to 2 C of the motor windings and the output side bearing assembly. Temperatures taken at the bellhousing were especially useful for fan cooled motors since this area was unaffected by convective cooling from the fan. Temperature limits and trending of motor temperatures are two of the many topics covered in the Level II Infraspection Institute Certified Infrared Thermographer® training course. For more information on upcoming classes or to obtain a copy of our Cross Technologies Study, call 609-239-4788 or visit us online at www.infraspection.com. Energy and environmental concerns have caused many facility owners to look to their roofing systems for ways to conserve energy. Modern roofing systems known as ‘cool roofs’ can provide savings; however, they can present challenges for thermographers who inspect them. Over 90% of roofs in the United States are dark colored. On sunny days, temperatures of these roofs can reach 150º to 190º F causing decreased indoor comfort, increased cooling costs, and premature aging of roofing materials. Advances in roofing technology have led to the development of ‘cool roof’ systems that help to solve these challenges. Cool roof materials have a high solar reflectance or albedo. Compared to conventional roof materials, cool roofs operate at lower temperatures since they absorb less energy from the Sun. Cool roofs also have a high thermal emittance enabling them to radiate well and shed heat quickly after sunset. Cool roof membranes are usually made of single-ply rubber or plastic materials such as EPDM, PVC, and TPO. These materials are usually white in color and have a smooth surface. Cool roof coatings or paints are an alternative for existing low-slope roofs. Although cool roof materials are rated to have a high emittance, thermographers should remember that this value is an average emittance value calculated in a laboratory under ideal conditions and at a perpendicular viewing angle. During an infrared inspection, smooth-surfaced roofs appear quite reflective to a thermal imager due to the low viewing angle that is usually associated with inspections performed on foot from the roof surface. This condition is most severe on cloudless nights when atmospheric humidity levels are low. Due to the low emittance associated with smooth roof surfaces, thermographers can easily miss the small temperature differentials associated with latent moisture. In order to mitigate errors associated with low emittance, thermographers should choose a short wave (2 to 5.6 microns) thermal imager whenever inspecting a smooth-surfaced roof regardless of membrane color or material. With prices ranging to over $10,000, a thermal imager can represent a considerable investment. For companies getting started in thermal imaging, renting an imager can provide a cost effective alternative to purchasing a system outright. With the height of Summer, many thermographers focus their attention on the discomfort associated with heat and humidity. Those who spend time outdoors should also be aware of the health hazards associated with unprotected exposure to the Sun. Following a few simple tips can help protect you from the harmful effects of UV radiation. Use sunscreen. A sun protection factor (SPF) of at least 15 blocks 93 percent of UV rays. You want to block both UVA and UVB rays to guard against skin cancer. Be sure to follow application directions on the bottle. Wear a hat. A wide brim hat (not a baseball cap) is ideal because it protects the neck, ears, eyes, forehead, nose, and scalp. Wear UV-absorbent shades. Sunglasses don’t have to be expensive, but they should block 99 to 100 percent of UVA and UVB radiation. Limit exposure. UV rays are most intense between 10 a.m. and 4 p.m. If you’re unsure about the sun’s intensity, take the shadow test: If your shadow is shorter than you, the sun’s rays are the day’s strongest. For more information on this topic or on other workplace safety and health issues, visit www.osha.gov. Most people have experienced the discomfort of sunburn at one time or another. Few tend to realize that unprotected exposure to the Sun increases one’s risk of developing skin cancer which can be fatal. Early detection is your first line of defense in treating skin cancer. It’s important to examine your body monthly because skin cancers detected early can almost always be cured. The most important warning sign is a spot on the skin that is changing in size, shape, or color during a period of 1 month to 1 or 2 years. 1. Visually inspect capacitor bodies. Capacitors should not be misshapen or swollen. 2. Thermographically inspect capacitor bodies. Capacitors should be warmer than ambient air temperature and exhibit equal temperatures across all phases. 3. Check bushing and wiring connections for hotspots. When performing infrared inspections of large structures or systems, it is often difficult to see “the big picture”. For some systems, performing an infrared inspection from an aircraft may provide a solution. 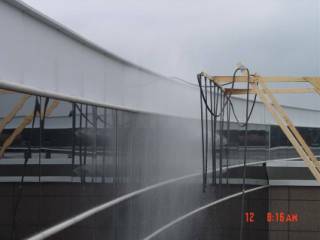 Large structures such as industrial roofs, buried steam systems and pole-mounted electric power lines can be difficult and time consuming to inspect from the ground. Often, a thermographer’s field of view is limited to a small portion of the subject system making qualitative comparisons more difficult. For systems spread over a wide geographic area, maneuvering over the ground can require a considerable amount of time. 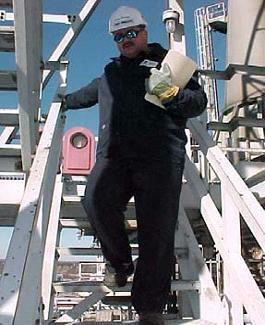 An alternative to ground-based infrared inspections is to perform them from an aircraft. Airborne infrared inspections provide a macro view of the subject system and can reduce inspection time by eliminating ground-based obstacles. Imager’s ease of use from within an aircraft. For lengthy projects, remote-controlled, fixed-mount imagers provide less stress for a thermographer. Due to the logistics and costs associated with aerial infrared inspections, one may wish to consider hiring an experienced consultant who specializes in aerial infrared inspections. Performing infrared inspections from aircraft is one of the many topics covered in the Level I Infraspection Institute Certified Infrared Thermographer® training course. For information on open enrollment classes or our Distance Learning program, visit us online or call us at 609-239-4788. With Summer upon us, many will return to outdoor cooking on a regular basis. In this Tip we offer important safety considerations for all outdoor chefs. When you are finished grilling, let the coals completely cool before disposing of them in a metal container. Check the gas tank hose for leaks before using it for the first time each year. Apply a light soap and water solution to the hose. A propane leak will release bubbles. If your grill has a gas leak, detectable by smell or the soapy bubble test, and there is no flame, turn off the gas tank and grill. If the leak stops, get the grill serviced by a professional before using it again. If the leak does not stop, call the fire department. If you smell gas while cooking, immediately get away from the grill and call the fire department. Do not move the grill. If the flame goes out, turn the grill and gas off and wait at least 15 minutes before re- lighting it. Infrared inspection of bearings is one of the many topics covered in the Infraspection Institute Level I Certified Infrared Thermographer® training course. For more information or to register for a course, visit Infraspection Institute or call us at 609-239-4788. Infrared inspection of flat roofs is one of the many topics covered in all Infraspection Institute Level I training courses. For more information on thermographer training or to obtain a copy of the Standard for Infrared Inspections of Insulated Roofs, visit Infraspection Institute or call us at 609-239-4788.